Re: What was your first computer? (a friends ZX81)->ZXSpectrum 48K->Oric 1->Commodore 64->CASIO handheld->(other pepole's PCs and Amiga A500)->Amiga A1200->Various PC desktops->a laptop->Thinkpad->desktop PC->EeeeeePC A901->Pi : And various CPU/microcontrollers along the way. Several home brew machines from the 70's. Cards from one of my 8080 machines. A very old (70's) HP 'desktop' with single line LED display and teletype printer and built in cassette storage, also could do paper tape via the teletype. Many many other computers and micros since then. VIC-20...at the time wanted an Atari 400 because I had an Atari 2600, but the sales person talked me out of it saying a real keyboard was much better then that stupid membrane keyboard the Atari 400, plus the cost savings had a lot to do with it...I was able to get some extra stuff with the VIC-20 like a data cassette player and extra RAM. The rest was history as they say as I went on to help assist in developing some the technologies we all use now a days like Wi-Fi, Ethernet and that thing call the Internet . Still I miss those days when the computer world was so new that it seem like the possibilities were unlimited...sure that's still somewhat true today, but now a days we have a better concept of what processor speed, RAM size, and graphics power can and can't let us do. Back in the late 80s at university, I remember getting to use this thing called JANet. It was great, I was able to send something called an email to my friends at other universities, browse documents and all sorts of weird and wonderful things. Mortimer wrote: Back in the late 80s at university, I remember getting to use this thing called JANet. ah JANET, many fond memories of her. with that terrible membrane keyboard. A lifetime of upgrades, technology advances, operating system evolutions and fiddling with computers and finally something like the PI comes along! Its funny to see how fast technology has progressed with regards to size and 'power' over the years, my new Raspberry PI Model B is is about a minimum of 12th of the size (C*64) of those:). ZX81, modified to support a 'real' keyboard, had the extra memory(16K) and thermal printer! Mostly Dell PCs from here as well as Microchip microcontrollers. Really having fun with the Raspberry Pi! NCR 310 - ZX81 - Apple II+ - Dell/Intel - Mac mini... Raspberry Pi! An acorn electron, kind of the BBC Micro's little and cheaper brother, i know very few people who had one, I suspect it must have been reduced, most of my possessions as a child seemed to have been. Its still in my loft and it still works, i plugged it in a couple of years back, the only thing i could find in the house with a composite in was a projector so i played an ancient game on an 90" inch.... It took a few google searches to find the command to load a game from tape, CHAIN "". "am I getting slower, or is stuff more complicated; either way I now have to write it down - stuffaboutcode.com"
Sadly, thoughout my life i haven't been around people who was interested in computer science (as i was) so i feel like a permanoob on programming. Grumpy Mike wrote: Back in 1975 there were no designs for a micro computer published, so I had to design my own. 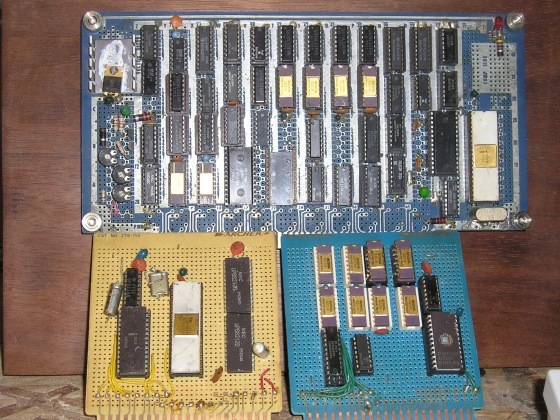 I used the 2650 Signetics chip and it has 256 bytes of memory. That my friend looks like stuff i make today... I love electronics mounted on wood, there's a certain irony to it. The first computer I OWNED ( actually just got it recently , awesome but not for everyone ) was my Open Pandora . EXTREMLY Off topic I know but The Prometheus here doesn't happen to be the ex-mod from the open pandora boards ? 10 print "Enter a number: "
My classmates spent hours trying to guess the number. My first computer was a really slow desktop, with a Pentium 3 and Windows ME. I forget the specs and I no longer have it around (I was like 5 at the time, and once I broke the CD drive tray, my dad took the computer away from me). My first serious computer was a Pentium 4 2.4GHz, 256mb RAM, a nice Radeon graphics card, a 40GB HDD and it had Windows XP. I got this in 2003 and it was a beast. I used it for five years (something you don't see much these days) until I moved on to the world of multicore CPUs and laptops. C64 was my first real computer, I had a few other TV Game type devices beforehand though. My first computer was a National Semiconductors "Scamp" kit. This had a single CPU, 1K of EEprom and 64 bytes of ram. This was 1973. Microcontrollers were is short supply. We built an EEprom eraser out of a wooden box and a UV lamp. We "wrote" the code in assembly language by writing down the Op Codes on paper then inputed them to the EEprom directly on a EEprom programmer. From this I moved on to the Motorola MC6800. Each morning I had to enter 2k bytes of program into the ram so that testing could begin (about 1-2 hours). I still remember some of those Op Codes!!! Then, to speed up product develoment, I made a Kansas City interface for a tape recorder to which I could store my code and retrieve it (1 -2 minutes). Microcontollers have moved on apace since "back in the day". I now mostly use ATmel and PIC devices, these all come with C compilers and debug environments which reside on PC's, making development very easy. I decided to give the Pi a chance so that I could develop some projects at home, Geek Alarm!! !, but up to now I am finding the experience very difficult, there is a wealth of data available but not supplied in a constuctive form - everybody is an expert, everybody has done it there own way everybody uses there own gargon - when did an I/O board become a Shell? When did a Batch file become a Bash? Well the first machine I got my hands on was a TRS-80 from Radio Shack. We had a few of these at school and did some (very) basic programming on them. I was in love. Later, I got the venerable Commodore 64 and it was my best friend for several years. Basic programming and gaming. Its funny, today I have all these amazing games with breathtaking graphics and spectacular gameplay, but I really did have just as much fun with Zork, MULE, Elite, and Ultima.